I have a current project with a green wall, aka living wall, and other greenery in the space. I’ve been given conflicting information about the lighting requirements I need to meet are and how to measure them, so I did some research. This isn’t definitive, but here’s what I’ve found. 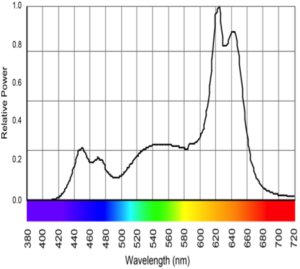 First of all, the measurement units that we’re all familiar with don’t apply to horticulture because the average plant’s response to light is very different from that of the human visual system. 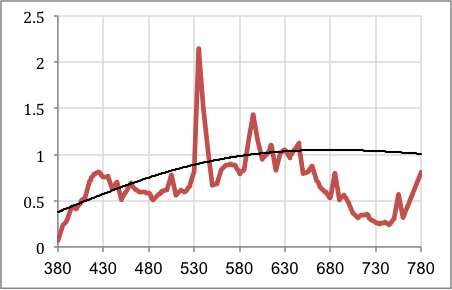 We know that the human eye response curve is V(λ) (pronounced vee lambda) which is shown in Figure 1. 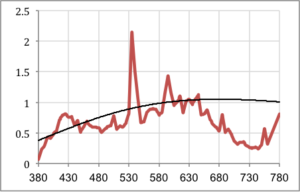 Our response to electromagnetic energy falls between 380 and 770 nm, with a peak response at 555 nm. In order to measure light the way the human visual system perceived it, V(λ) is folded into the definition of the lumen, the footcandle, etc. Plants, however, have a response curve called the photosynthesis action spectrum, shown in Figure 2. 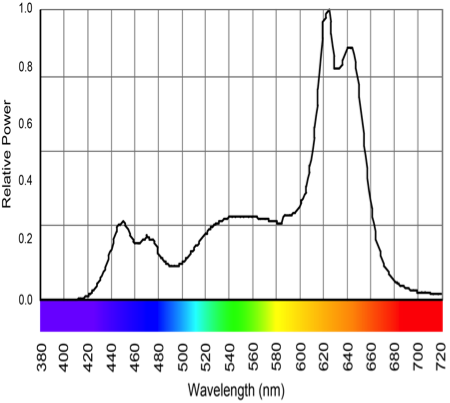 The wavelengths of light that are absorbed and used by plants are below 520 nm and above 610 nm [i], which roughly equates to the blue and red range of the visible spectrum. Plants need a great deal of red light, a far amount of blue light, and little or no green light. So, we can’t talk about the amount of light delivered to plants in a useful way if we’re using lumens and footcandles. 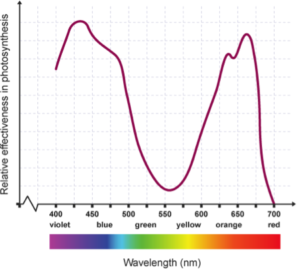 The measurement of light for plant health is Photosynthetically Active Radiation (PAR) [iii]. There are PAR calibrated light meters, and digital tools to convert lux/footcandle readings to PAR. Other common measurements are also not relevant to horticulture. 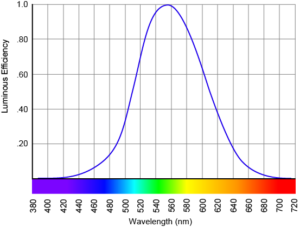 Color temperature is a numerical indication of the warmth or coolness of white light, but warmth or coolness are aesthetic criteria and are not relevant in light for plant health. 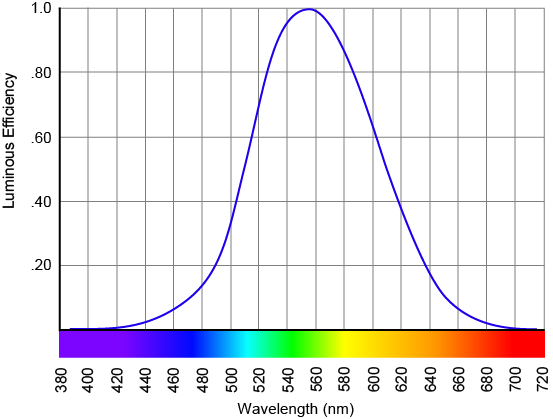 CRI is an indicator of how well a light source allows us to see colors when compared to a reference light source. The response of the human visual system to light is built-in to the CRI calculation. Again, for plant health we are not concerned with seeing the colors of the plants so this metric is not relevant. What kind of light should we provide? Incandescent light has an appropriate balance of red and blue light for plant health, as shown in Figure 3. The power consumption will be high. Fortunately, power consumed by the lighting for plant health is exempt from the energy conservation codes. However, with their short life and high power consumption incandescents are, overall, a poor choice. 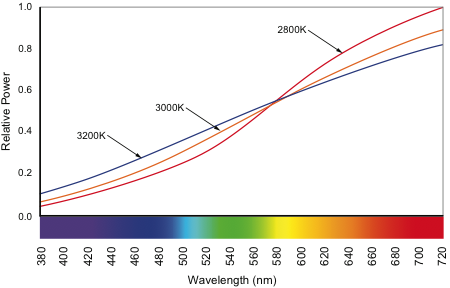 High color temperature metal halide lamps have been the horticulture light source of choice for a long time because their SPD provides an appropriate balance of red and blue light (Figure 4). While metal halide lamps are being replaced by LEDs in many applications, I expect they will be available for at least the next decade. For my project, these fixtures would only to be used during the green wall’s growth period in the morning before the space opens to the public. A second set of fixtures with warmer light will be used when the space is open so that I could light the wall in a way that is in balance with the rest of the space during operating hours. Therefore, an alternative to metal halide fixtures is multi-colored LED fixtures. Since multi-colored LED fixtures allow users to control the brightness of each color individually one could opt for a fixture with a Red, Blue, White (RBW), a Red, Red, Blue, White (RRBW), or a Red, Blue, Blue, White (RBBW) set of LEDs. This would permit one fixture to provide light for health and accent light. One possible result of a RBW fixture is shown in Figure 5. This is a much better match to the photosynthesis action spectra than incandescent, metal halide, or white LEDs. For the time being, the people responsible for the greenery have asked me to stay with the tried and true metal halide lamps. In the near future, as metal halide lamps become rarer, and as LEDs become more common in horticulture, I expect we’ll be changing over to LEDs. [i] Yingchao Xu, Yongxiao Chang, Guanyu Chen, Hongyi Lin, The Research On LED Supplementary Lighting System For Plants, Optik – International Journal for Light and Electron Optics, Volume 127, Issue 18, September 2016, Pages 7193-7201, ISSN 0030-4026, http://dx.doi.org/10.1016/j.ijleo.2016.05.056. [ii] The Science of Food Production, http://www.bbc.co.uk/education/guides/z23ggk7/revision/2. [iv] Livingston, Jason, Designing Light: The Art, Science, and Practice of Architectural Lighting, Hoboken: John Wiley and Sons, 2014. [v] TM-30-15 Advanced Calculator, Illuminating Engineering Society, New York: Illuminating Engineering Society, 2015. [vii] Filippos Bantis, Theoharis Ouzounis, Kalliopi Radoglou, Artificial LED Lighting Enhances Growth Characteristics And Total Phenolic Content Of Ocimum Basilicum, But Variably Affects Transplant success, Scientia Horticulturae, Volume 198, 26 January 2016, Pages 277-283, ISSN 0304-4238, http://dx.doi.org/10.1016/j.scienta.2015.11.014. ← A New Lumen Definition For Efficacy Regulations?